Sole Fitness B94 upright bike was engineered for comfort and ease-of-use. Offering an ergonomic design, adjustable seating, a large easy to view console display, and a strong durable frame, the B94 is a well-built fitness solution that makes getting into shape enjoyable and easy. Lightweight, durable, easy-to-use and with a space-saving design, the B94 upright stationary bike is the perfect addition to your home gym. The B94 was designed for comfort because Sole Fitness recognizes that working out doesn’t require being uncomfortable to be effective. The natural comfortable feel of the B94 stationary bike is the result of a uniquely ergonomic design, adjustable seating, and specially designed pedals. The ergonomic design of the B94 bike pedals is unique owing to the 2 degree inward cant on the pedal. This effectively prevents aches in the knees and feet from occurring by aligning the joints in their correct posture during your workout. Most exercise bicycle users will tell you the number one priority in using an upright bike is being comfortable without sacrificing challenge in the workout. 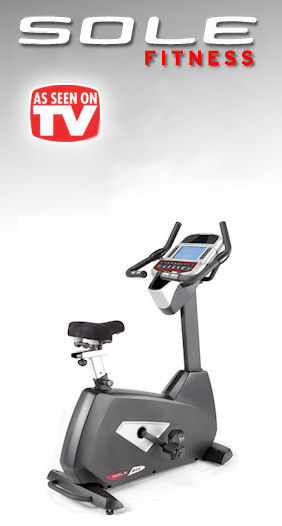 The B94 stationary bike provides both comfort and a challenging workout for a very affordable price. The adjustable gel seat, strong frame and ergonomically designed pedals allow for the machine to conform itself to you instead of the other way around. The B94’s advanced programs and 9″ LCD display provide you with fast effective fat burning and cardio exercises, helping you to spend more time focusing on reaching your goals. There are 10 challenging programs to choose from – everything from Hill to Heart Rate Control. It’s also great for those just starting out and others who are training, plus you can also design your own programs using the custom user-defined program feature. The B94 upright bike from Sole Fitness is designed to provide a powerful total body workout that will get you in shape fast while also being friendly to your budget. It’s well suited for use in the home or a light commercial environment.